Hein de Haas: Will a 'Brexit' curb immigration? Will a 'Brexit' curb immigration? Leaders of anti-immigration parties such as Nigel Farage of the UKIP (United Kingdom Independence Party) and Geert Wilders' of the Dutch Freedom Party have often stated that getting out of the EU is the only way to curb immigration. At first sight, this seems logical. After all, as long as countries stay in the EU, they have to respect the free mobility rights of half a billion EU citizens. This is also why promises by politicians to cut back migration, such as the earlier pledge by the British PM David Cameron to bring UK net immigration down to below to the "tens of thousands" are hollow, since a large share of immigration consists of EU citizens, who are exempt from immigration controls. For instance, in the 12 months preceding September 2014, about 40 per cent of immigrants were non-British EU citizens, while 13 per cent were British citizens, and 47 per cent were non-EU citizens. The whole idea that immigration can be controlled just like we turn on and off a tap is a myth. This is once again shown by the increase in net immigration to the UK from an estimated 154,000 in (the year preceding September) 2012 to 298,000 in 2014 - showing the hollowness of Cameron's earlier promise to bring net immigration down below the 100,000 mark. 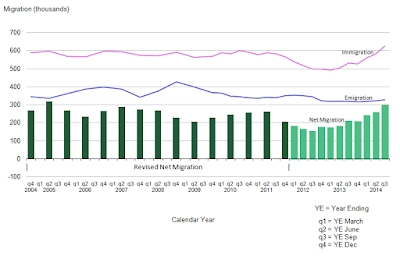 The recent increase in immigration to the UK is largely the result of a growth in labour immigration, which reflect increasing labour demand and falling unemployment in the UK. In general , levels of immigration are primarily driven by economic growth and labour demand rather than by immigration regulations - no matter how much politicians would like voters to believe that they are in control. It is therefore unlikely that a 'Brexit' would drastically curb immigration, certainly if the UK wishes to remain an economically open country. In this respect it may be interesting to look at migration to European countries that are not member of the European Union. Switzerland, for instance, has always insisted on its independence, and has a long-standing tradition of anti-immigration politics. This has been reinforced by the rise of country’s right-wing populist Swiss People’s Party (SVP) since the 1990s, which favours major immigration restrictions. 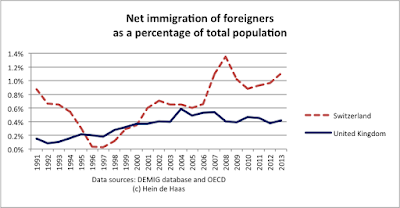 However, despite not being member of the EU, migration to Switzerland has soared to unprecedented levels over the last two decades, with yearly net-immigration (immigration minus emigration) of foreign nationals hovering around levels of 1 per cent (see graph). This structural increase of migration to Switzerland is linked to economic growth combined with an ageing population, which has generated a continued labour demand in higher and lower skilled jobs, for which there is not sufficient domestic supply. These economic demands have put pressure on successive Swiss governments to continue allowing immigrants in. There is little reason to believe that if the UK leaves the EU, such structural labour market demands and economic pressures would not persist, and that governments would not succumb to such pressures, as they have always done in the past. 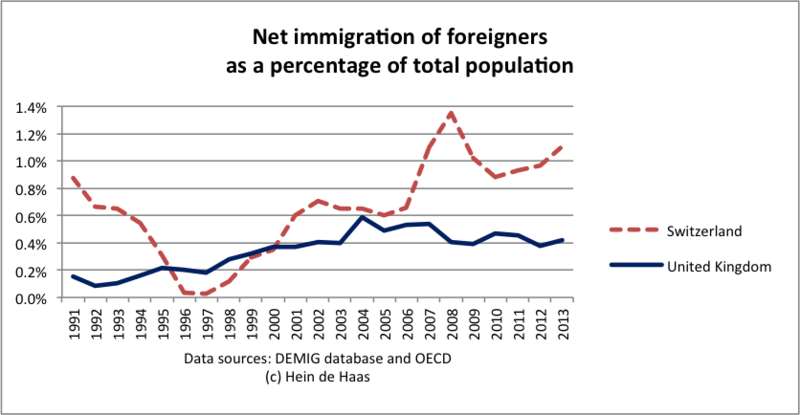 As the graph also shows, since the early 1990s there has been a structural increase of net immigration to the UK. This increase can be largely explained by a combination of economic deregulation, renewed economic growth, decreasing unemployment and a decrease of domestic labour supply because of demographic factors and skill shortages. It it is therefore inaccurate to link the structural increase of UK immigration since the early 1990s to the decision by the Blair government in 2004 to allow free immigration from new accession states in Eastern Europe. As the graph clearly shows, the increase of new migration to the UK has been a structural, long-term trend which started in the early 1990s. In 2003, net immigration already stood at levels of 0.4 per cent, up from 0.1 per cent in 1992, to jump up to around 0.6 percent in 2004 to consolidate at levels between 0.4 and 0.5 percent in the last decade. The decision to allow free mobility from new EU member states by the Blair government has consolidated, rather than being the most important cause of, pre-existing trends of rising immigration to the UK. Assuming that the UK wishes to remain a wealthy and democratic country with an open, deregulated market economy (which all major parties including UKIP seem to wish), it is therefore very unlikely to expect a major decrease of immigration. The immigration of low and high-skilled workers and students (both major sources of immigration) is likely to continue as it is the case in other non-EU countries, and these migrants will inevitably be accompanied by family members. Although receiving a lot of attention, asylum migration is actually a small component of UK immigration (24,914 asylum applications in 2014, which is 4.6% of total foreign immigration). Further curtailing asylum migration would imply serious encroachments on fundamental human rights. And even if UK would really be willing to do that, the effects are likely to be limited. As migration researcher Timothy Hatton has found in a sophisticated statistical analysis, fluctuations in asylum migration are mainly driven by levels of violence and terror in origin countries, and restrictiveness of asylum policies only play a secondary role. As long as future UK governments will not wreck the economy (which in many ways is by far the most effective way of bringing down labour demand and, as a consequence, immigration) or will not de-liberalise the economy (such as by drastically increasing labour market regulation and employment protection) it is likely that immigration to the UK will continue at high levels whether the the country leaves the EU or not. On top of that, closing the borders to migration of EU citizens is likely to have a number of unintended side effects (so-called 'substitution effects') which can make such policies partly if not entirely counterproductive. First of all, border closure can lead to a wave of 'now or never migration' by people who try to get in before it before it is too late. Such 'beat the ban rushes' happened in the past, for instance when Britain introduced restrictions for 'West Indian' migration with the 1962 Commonwealth Immigrants Act. Second, closing the border will interrupt the free circulation of EU migrants. As we have found from research in the DEMIG (Determinants of International Migration) project at Oxford University, immigration restrictions bring down return migration by roughly the same extent as immigration, making the effect of restrictions on net migration very small or insignificant. In order words, borders restrictions have the tendency to push migrants into permanent settlement. This has happened at many occasions in the past. For instance, when West European countries closed the borders for Mediterranean 'guest workers' after the 1973 Oil Crisis, many workers who initially intended to return decided to stay. Because they feared not to be able to re-migrate after return, immigration restrictions encouraged their permanent settlement, followed by a (another unanticipated) wave of family migration. Because EU citizens can move freely, their migration tends to be highly responsive to economic opportunities. In other words, EU migrants are much more likely to return in case of unemployment than non-EU migrants who have invested considerable effort in obtaining work permits and visas. Closing the borders to free circulation of EU citizens would increase the likelihood of their permanent settlement and make such policies therefore partly or entirely counterproductive. In other words, assuming future economic growth and the continuation of liberal economic policies, continued high immigration to the UK (and other European countries) seems inevitable, whether in- or outside the European Union. Therefore, by suggesting that an exit from the EU will bring down immigration, leaders of anti-immigration parties such as Nigel Farage of UKIP or Geert Wilders of the Freedom Party are deceiving the public as much as 'mainstream' politicians such as David Cameron and Ed Milliband with their empty promises to curtail immigration after the next elections.